JOBS are in the firing line for civilian workers at a number of military hubs as a bitter employment row rubbles on. Unite, Britain’s biggest union, said at least six people working for contractor ESS, are to be made redundant. The workers provide a range of services at Fort Blockhouse, Whale Island, HMS Collingwood and HMS Sultan, from cleaners to mess hands. It is the latest chapter in an on-going saga between ESS and the union, which is adamant the firm has been ‘exploiting’ and ‘bullying’ staff. Union chiefs first lashed out last year after ESS –which is part of the Compass Group – changed the working hours of employees, cutting the number of paid working weeks from 50 to 48. Campaigners said the move was effectively a pay cut for staff and held a number of protests last year, with the latest taking place in March. Since then, the Ministry of Defence has re-awarded the contract to ESS to provide outsourced services at the four military sites in Gosport, Fareham and Portsmouth. Now staff have been fresh blow after ESS announced it would need to make a number of redundancies, initially on a voluntary basis, Unite said. Workers who have applied for voluntary redundancy are expected to be told this week if their application has been accepted and will leave ESS the following week. However, there are fears that if not enough voluntary redundancies are accepted, that compulsory job losses could be on the horizon. Richard White, Unite regional officer, said: ‘Yet again ESS is cynically exploiting its workers, in order to further boost its profits. ‘The company was not content to simply cut workers’ working weeks they are now cutting jobs. The News understands six posts were at risk when the announcement was made on June 19. However, ESS has not given any exact details on the number of job losses. 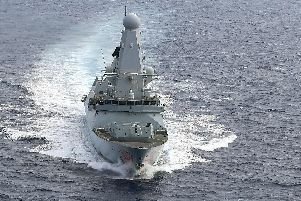 It said it had ‘reviewed’ its way of working since the new contract to deliver the ‘best value’ to the Defence Infrastructure Organisation (DIO).